But if your suppliers are so critical to your business, do you have a set of standards that apply to them? Many businesses don't, and it's a missed opportunity to make delivery and service more robust. It is easy to see yourself as the customer of a supplier, and to treat the relationship as a purchase relationship, rather than a partner relationship. The power balance is much more like a partner relationship, however. This is also how customers increasingly understand the supply chain. Consumer expectations go far beyond the basics of how you provide service to them. Consumer expectations are what caused Nike to implement supplier standards. Backlash about sweatshop labour in the Nike supply chain was the incentive for the company to make significant change. Eric Verhoogen, Associate Professor of Economics and International Affairs at Columbia University, argues that in some cases - as the Nike case - establishing standards won't happen unless there is external intervention. Customer backlash is one type of intervention that forces change. Similarly, a former CEO of Tiffany, Frederic Cumenal, wrote about traceability of supply in the supply chain. In a company like Tiffany, whose trade is in diamonds, that traceability is essential for both quality and ethics. Some of the world's most successful companies take a very definite approach to their supplier relationships. Japanese companies like Toyota and Honda go far beyond procurement. In their cases, the supplier relationship is much like an employee relationship. These companies measure the way their suppliers work. They set targets for them, they monitor their performance at all times. Why? Because Toyota and Honda expect their suppliers to meet their targets on quality and delivery. Such companies don't rely on suppliers to reduce wage costs. Instead, they believe that innovation capabilities are more important than savings. 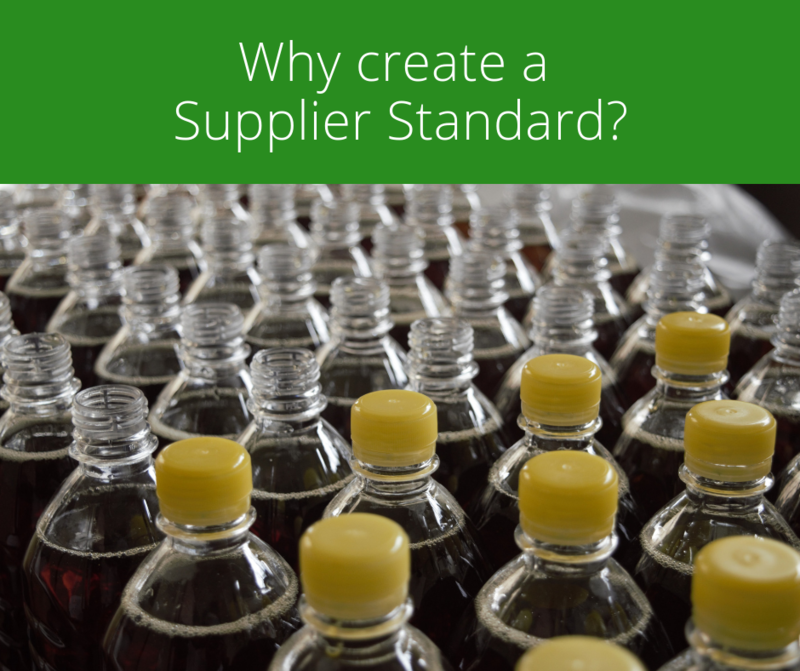 What your supplier standards cover depends on your industry, and the types of suppliers that provide services or products to you. (b) your supplier relationship better. your suppliers, you can deliver higher value than your competitors. Creating supplier standards allows you to minimize risk, particularly when it comes to your data. When you work with companies like myFLO, you want to make sure that your supplier can help you with compliance, but also with those rare - but devastating - events you hope you will never face. how the data architecture is created for reporting now and in the future. When you are thinking about purchasing field service software to drive your business, make sure that your supplier can deliver maximum yield and maximum flexibility. Visibility over your suppliers' performance can form part of your risk mitigation strategy. This is really where your supplier standards start interacting with your procurement processes. be facing is an unprofitable supplier. It impacts you, it impacts your clients, and it impacts your reputation. make your requirements known, and then allow you to build systems. We wrote about that here. gives your supplier meaningful targets. performance isn't up to scratch, you also have a central agreement against which to demand improvement. and tweak until your new idea flies. When you take the time to learn everything you can about your suppliers, you increase the chances that you can work together effectively over the long-term. beneficial outcomes by staying in the relationship. collaboration is valuable on both sides. innovations, and long-term company growth. We've been helping companies like yours to set the standard, since we began. today. For a confidential discussion, call 1300 78 46 60.